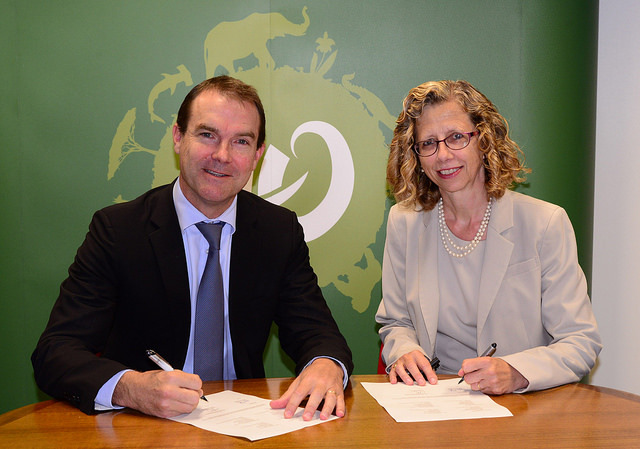 Geneva, 28 August 2015 - The Secretariat of the Convention on International Trade in Endangered Species of Wild Fauna and Flora (CITES) and IUCN, International Union for Conservation of Nature have signed an agreement this week to strengthen the cooperation between the two organisations in minimising the illegal killing of and related illegal trade in elephants and other CITES-listed flagship species in Sub-Saharan Africa, the Caribbean and the Pacific region. Over recent years, there has been a surge in illegal trade in wildlife, with elephants, rhinos, pangolins and some precious timber species among the most heavily affected. The illegal trade in these species is global in nature and is taking place at an industrial scale. Over 100,000 elephants are estimated to have been poached for their ivory from 2011 to 2013 across the African continent. In 2014, 1,215 rhinos were killed for their horns in South Africa alone - a figure that has risen alarmingly since 2007 when just 13 rhinos were poached. In combatting illegal wildlife trade, States are increasingly being confronted by transnational organised criminals, and in some cases rebel militia and rogue elements of the military, which have been driving poaching and illegal trade destined for illicit markets. The same criminal networks can also be used for other illicit trade, such as the trafficking in drugs, weapons and humans. Poaching and the illegal wildlife trade will be among the issues discussed at both the IUCN World Conservation Congress taking place from 1 to 10 September 2016 in Hawaii, U.S.A, and the 17th meeting of the Conference of the Parties to CITES, from 24 September to 5 October 2016 in Johannesburg, South Africa. IUCN Director General Andersen and CITES Secretary-General Scanlon and staff discussed preparations for both meetings and future collaboration. The Minimizing the Illegal Killing of Elephants and other Endangered Species (MIKES) project is funded by a 12 million Euro grant that the CITES Secretariat received from the European Union. It builds upon the Monitoring the Illegal Killing of Elephants (MIKE) Programme, which has been implemented together with African elephant range States by CITES with the support of the European Commission since 2001. The CITES Secretariat and IUCN have been collaborating on the implementation of the CITES MIKE programme in Africa for more than a decade. The Programme has documented alarming increases in levels of elephant poaching and identified drivers of illegal killing. It has also highlighted the urgent need for action to reduce the growing threat to elephant populations across Africa as a result of the escalating illegal trade in their ivory, as well as similar threats that are being faced by other CITES-listed large mammal species, such as black rhinos. The new agreement between CITES and IUCN reinforces the longstanding collaboration between the CITES Secretariat and IUCN in implementing the MIKE Programme in Africa. It provides a framework for extending this collaboration into new areas such as efforts to minimise illegal killing of elephants in ‘hot spot’ regions, applying MIKE monitoring routines to other species facing similar threats such as rhinos and great apes, and exploring new collaborations for implementing the programme in Asia. In the future, IUCN will host the MIKES Programme Sub-regional Support Units in Africa and South Asia, which are crucial for providing participating range States with technical assistance to implement MIKES monitoring activities. IUCN will also provide the administrative base for the MIKES technical advisors who will oversee efforts to build the wildlife law enforcement capacity of the eight African focal sites that have been selected to pioneer new measures to minimise poaching. IUCN is the world’s oldest and largest global environmental organisation, with almost 1,300 government and NGO Members and more than 15,000 volunteer experts in 185 countries. IUCN’s work is supported by almost 1,000 staff in 45 offices and hundreds of partners in public, NGO and private sectors around the world.